My husband and I had both been Rio de Janeiro quite a few times, thus it was not necessary for us to stay in the heart of the city and since we were going to have to say an unthinkable goodbye to each other on the last day of our honeymoon due to immigration issues, seclusiveness was what we were seeking. La Suite Rio was the perfect choice, as it is perched on top of the Joatinga cliffs, offering complete isolation from the hustle and bustle of the city. There are seven suites, each is assigned a different color and with the most fabulous room key I have ever seen in all of my travels. While we were not given the pink room, which probably would have been my first choice, we were given the blue room and it could not have been more suited for us. 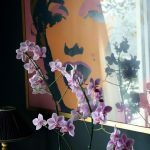 It has deep, dark masculine walls that appealed to my husband, however there is a gorgeous Andy Warhol print of Marilyn Monroe adjacent to a fuchsia orchid that pulled at my heartstrings. Another special touch included in the King sized bedroom is an iPod that had thousands of songs already downloaded onto it. The blue room also happens to have the largest private patio of all of the suites. The spacious en suite bathroom is as luxurious as they come, as it is draped in marble that matches the wall color of the bedroom and contains L’occitane products. Brasilians take their sun worshipping seriously, thus there are are pools on the premises. My favorite was the sixty-six foot infinity pool with a sheer drop into the Atlantic Ocean. The surrounding grounds are expertly landscaped with tropical flora. Breakfast, which is included in the room rate, is served on on the main terrace. Honestly, I am not sure if the meal or the view was better; they were both unforgettable. I could have spent days admiring every single detail found throughout the hotel. The owners have collected items from their travels around the world, as well as local flee-markets, to create the perfectly balanced ambience. The detail that most took my breath away though was the Philippe Starck, my favorite designer/architect, Baccarat mirror and chandelier in the lobby of the hotel. When I saw it, I instantly knew that I was in the right place. Wahooooo! I love hearing that!!! this looks so amazing and fun! You do know that I live vicariously through you, right? Amazing! Next time we go back I would love to see another color room to compare! VERY romantic!!! I have to take my wife here! Gorgeous! Love all the luxe chandis and the pattern mix…Global chic! I’m hosting 5 days of GIVEAWAYS with 5 chances to WIN in honor of my blog’s 2year anniversary! Would love for you to stop by and check it out! I love that you started your wedding and ended your honeymoon with Philippe Starck! I’ve had lunch in that area of Rio, and the views and seclusion are hard to beat – might have to check out La Suite next time I’m in Rio. OMG you are SO right! I honestly didn’t think about that. Very synchronistic!!! Next time you’re in Rio you should at least spend 1 day at La Suite. You would love love love it. Holy gorgeous…. that is incredible! We want to go to Rio soon… and this place is just breathtaking! i love the hotels you pick!!! I love all your picks, I need to get down to Brazil soon so I can start checking some of them out. If you travel to Brasil I want to help plan your trip!!!!! I love your pics as well as following you on your honeymoon! Thanks for sharing! Anyway I love the room keys! So cool! wow! this place is just breathtaking! awesome photos! have fun! :) kisses!! Isn’t it gorgeous!?! We had a lovely time there! Kisses!!! Definitely going to visit La Suite! Wahooooo that is awesome news! You always go to the best places! WOW take me there now! this is an amazing hotel! Did you seriously get that hotel stay sponsored! That is BRILLIANT! I’m so jealous, what a good way to subsidize travel while getting to stay in rad locations! I can’t get over these fabulous pictures! How beautiful is the scenery too?! And the little room keys are definitely the cutest I have ever seen. Now THAT is a hotel! I couldn’t agree more George! Me too darling, me too! absolutely beautiful images! beautiful water and that bright red color!! Isn’t it gorgeous!?! Ahhh, I wish I could be there NOW! Oh Andi this is such a romantic place! Wow, that looks beautiful, Andi! I love the keys! Holy moly, that is simply gorgeous!!! Couldn’t agree more Alyx! Love the spelling of your name btw. Perfect place to end your honeymoon! I would have never had left that pool! Trust me it was hard! Next time I’m in Rio I’m going there! Thank you for stopping by! Your blog is so lovely!! You’re welcome and thank you sooo much!!! I would love to return to La Suite, hope you can make it there too! thanks for telling us about this lovely place! Great pick of a hotel! I thought so too Tom! Wouahhhh I guess you’ve had a great time there. Rio is definitely on the top list of destinations I wanna visit. Btw, thank you so much for all your lovely comments dear, it means a lot to me. I can’t even IMAGINE having to part right after your honeymoon. Ugh, immigration is no joke! My husband wasn’t a citizen when we got married, but he was a permanent resident so we didn’t have to go through that. Just mounds and mounds of government paperwork. Hope you’re both in the same place now or will be soon! that pool is to die for!!!! Right!?! Too bad we only had 1 day there. I love when hotels take the time to differentiate themselves with the little details. The modern design with an interesting mix of one part minimalism one part kitsch is cool! Agree 110%!!! It’s SO important in this new age of boutique hotels to set yourself apart from the rest. There is noticeably the most beautiful place ever! Looks like a nice place, love the chandeliers! Yes, couldn’t agree more Adam!!! You’re way too kind, thank you! Wow! This looks like such a beautiful hotel. The infinity pool with wooden decking is perfect for sun worshipers. How do you search for hotels? I’m trying to plan a trip to Italy but am struggling to find somewhere unique to stay. If you want to shoot me an email I’m happy to help you find one! I’ve got lots of tricks plus lots of contact. XOXO My email is AndiPerullo@aol.com. The room keys are ridiculously adorb! The pool looks amazing and that view.. surreal. I love Rio. What a beautiful city. Isn’t is marvelous!?! Ahhh I want to live there so badly! I still can’t, a year later, get over those keys! It looks like a fairy tale come true. Yes, I am so glad that we had such a special place for our last stop and for the place we had to say goodbye. The view was SUPERB!!! 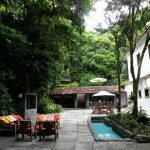 I stayed at La Suite in Rio as well – how amazing is it? I still dream of those views. Such a great retreat from the craziness of Rio but not too far away. Which color room did you get??? I love that you stayed there too! Sooooo romantic! I want to go! And the blue room sounds PERFECT. You would take the most ridiculously gorgeous pics there!!! They do photo shoots ALL of the time there. it was really excellent post! i always like to read this blog. that place looks out of this world! i need a little sunworshiping soon and im not sure where i need to go do it…maybe the place is right there! Go!!!!!!!!!! OMG you will love love love it! Beautiful! I have to go here and soon! What an absolutely beautiful hotel and I just love your pictures, as always! Everything, but mostly that pool!! Unbelievably beautiful. i would like to visit here someday! I hope you can Aidê! Wow… out of this world Andi. That is the perfect way of describing it gorgeous! thanks for telling me about this place, i’m definitely going to visit! You will love it Debora!